Found in St. Luke's Gospel (ii, 29-32), is the last in historical sequence of the three great Canticles of the New Testament, the other two being the Magnificat (Canticle of Mary) and the Benedictus (Canticle of Zachary). All three are styled, by way of eminence, the "Evangelical Canticles". The title is formed from the opening words in the Latin Vulgate, "Nunc dimittis servum tuum, Domine" etc.). ("Now thou dost dismiss thy servant, O Lord" etc.). 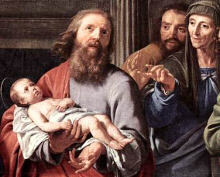 The circumstances under which Simeon uttered his song-petition, thanksgiving, and prophecy are narrated by St. Luke (ii. 21-35). The words following those quoted above, "according to thy word in peace", are explained by v. 26: "And he had received an answer from the Holy Ghost, that he should not see death, before he had seen the Christ of the Lord." Brief though the Canticle is, it abounds in Old-Testament allusions. Thus, in the following verses, "Because my eyes have seen thy salvation" alludes to Isaias, lii, 10, rendered afterwards by St. Luke (iii, 6), "And all flesh shall see the salvation of God". Verse 31, "Which thou hast prepared before the face of all peoples" accords with the Psalmist (xcvii, 2); and verse 32, "A light to the revelation of the Gentiles, ad the glory of thy people Israel", recalls Isaias, xlii, 6. The text of the Nunc Dimittis is given in full in the brief evening prayer found in the Apostolic Constitutions (Book VII, xlviii) (P.G., 1, 1057). In the Roman Office, the canticle is assigned to Complin. If St. Benedict did not originate this canonical Hour, he gave to it its liturgical character; but he nevertheless did not include the Canticle, which was afterwards incorporated into the richer Complin Service of the Roman Rite, where it is preceded by the beautiful responsory, "In manus tuas, Domine, commendo spiritum meum" (Into thy hands, O Lord, I commend my spirit) etc., with the Antiphon following, "Salva nos, Domine, vigilantes, custodi nos dormientes" (O Lord, keep us waking, guard us sleeping) etc., all this harmonizing exquisitely with the spirit of the Nunc Dimittis and with the general character of the closing Hour of the Office. In the blessing of the candles on the feast of the Purification of the Blessed Virgin, the Canticle, of course, receives great prominence both in its text and in the references to Simeon in the preceding prayers. Its last verse, "Lumen ad revelationem" etc., forms the Antiphon which not only precedes and follows the Canticle, but also precedes every verse of it and the Gloria Patri and Sicut erat of the concluding doxology. The symbolism of the Canticle and of its Antiphon is further emphasized by the lighted candles of Candlemas. The complete Canticle also forms the Tract in the Mass of the feast, when the 2 February follows Septuagesima.